Bluffdale is the first city to pass the Financial Ready Utah resolution.The resolution was passed on Tuesday, Feb. 26. Councilman Bruce Kartchner, a CPA, says, “We have a mayor and city council that are fiscally conservative. They recognize the prudence of contingency planning related to federal funds and they wanted to show their support for the ideals being promoted by Financial Ready Utah. Are you interested in passing this resolution in your city, please get in touch at info@financialreadyutah.com. The Utah Association of CPA’s have been active in the dialog about fiscal sustainability. The UACPA’s President-elect Kent Thomas was published recently in the Deseret News with an editorial explaining why resolving these debt issues is a concern to a CPA. As a certified public accountant and advisor to many companies, I routinely deal with the uncertainty of projecting next year’s revenue and expenses. The budgeting process involves using the best information we can acquire about our business, our customers’ plans to buy from us and our suppliers’ plans for pricing and supply and making the best assumptions we can about key variables and how they may change over time. We do this as businesses in order to look into the future to make sure we are aware of and can plan for opportunities and challenges that lie ahead. 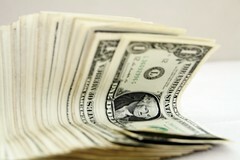 If I learned through the budgeting process that my largest customer, who represented up to 30 percent of my company’s revenues were likely to reduce or eliminate their purchases from my company, my failure to take immediate and effective action to plan for this eventuality would be a dereliction of my duties as a chief executive or chief financial officer. In order to properly fill my role, I would take decisive action to evaluate all aspects of our company to find ways to reduce costs, improve efficiency and, if possible, find new customers to make up some of the expected losses so that we could weather the storm and stay in business. The state of Utah is not unlike a business — it prepares budgets each year in much the same process as described above and our elected representatives are responsible to be just as diligent in making sure that we are looking into the future and planning properly. As we evaluate the state’s budget, we quickly recognize that subsidies and payments from the federal government represent in excess of 30 percent of the state’s “revenue.” This is money that helps fund Medicaid, transportation, public safety, environmental quality, public education, the National Guard and other programs. Like a good business, some of our elected representatives are asking the question, “What happens if this revenue were to be reduced by 5 percent to 30 percent because the federal government can no longer provide the subsidies that we have become used to?” I applaud these efforts because the result is not pretty, the process of deciding what we should do is not exactly fun and the decisions are not going to be popular or easy for the citizenry to accept. As I see it, however, we can either take action on our own now and create a well thought out plan in which we decide how we will experience the “pain,” or we can hope that nothing happens (almost 100 percent sure not to be the eventual outcome) and allow a rushed, emergency session of the Legislature to determine how the pain is delivered. I invite all Utah citizens to learn about what the Legislature and business leaders are doing and get involved. 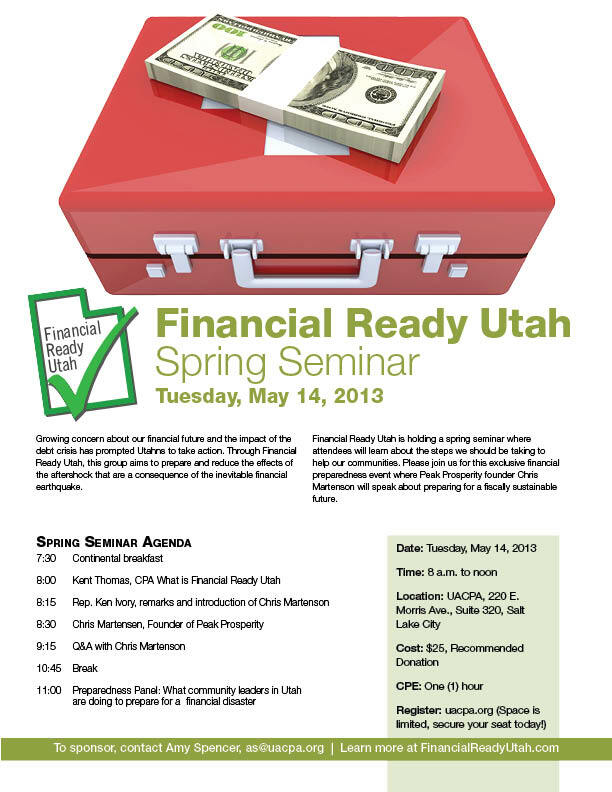 The Legislature has formed the Fiscal Sustainability Legislative Task Force and business and government leaders have started a movement called Financial Ready Utah, where you can get educated and take action. This initiative will take a concerted effort from all of us in order to be successful. Kent L Thomas is a CPA and is the founder of Advanced CFO Solutions, as well as the president-elect of the Utah Association of Certified Public Accountants. Kent Thomas, President-Elect for the Utah Association of CPAs, joined Rod Arquette to explain the Financial Ready Utah initiative and discuss the importance of getting involved. The interview is from 17:05-24:00 minute marks. 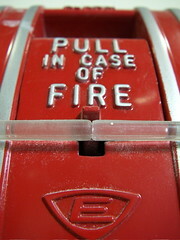 Local news outlets have been buzzing since the Feb. 12 press conference announcing how Financial Ready Utah is pulling the financial fire alarm. Here are the articles that were published following the press conference.